field, presents this model as the new standard PAS. A lighter, more compact P.A.S. unit enables a lighter overall body weight. The battery recharging time has been reduced to approx. 2.8 hours and features like convenient main switch and charge level lamps make this bike even more practical than ever before. 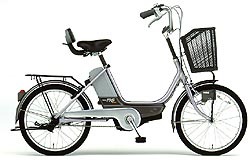 Other new features include (1) a PAS Auto Lamp (halogen bulb, also connects through battery to rear lamp) that comes on automatically with the function of light and vibration sensors, (2) a seat with backrest that enables a more relaxed riding position, and (3) a rear carrier. 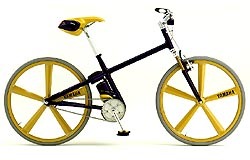 This is a next generation electro-hybrid bicycle based on the popular New PAS launched in January of 1997 featuring further improvements on all basic functions. New features include (1) the new PAS Auto Lamp (halogen bulb, also connects through battery to rear lamp) that comes on automatically with the function of light and vibration sensors, (2) quick battery recharging in about 2.8 hours, (3) easy-to-operate grip-shift type built-in 3-speed gear changer and (4) powerful roller brakes. Taking the sporty and stylish new PAS Star Cross with its front suspension and cross frame as its base, this model adds features like a small size lightweight nickel-hydrogen battery and an automatic gearbox to offer an expanded world of PAS enjoyment. liquid-cooled, 2-stroke V4 engine that delivers 180 horsepower. Excellent power development characteristics and outstanding handling characterize this machine. This is the factory machine that Noriyuki Haga of Marlboro Yamaha Racing Team rode to win the '97 All-Japan Superbike Championship. 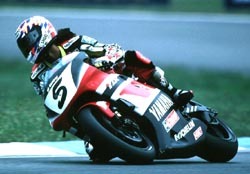 In its endurance spec the YZF750 holds the race record of 214 laps in the Suzuka 8-hour Endurance Race. In both specs this machine's outstanding agility and handling characteristics are the key to its competitive success. 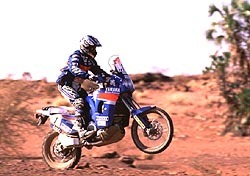 This is the machine that Stephane Peterhansel rode to win the '97 Dakar-Agades-Dakar Rally, giving Yamaha its 8th victory in the Dakar Rally, a race known as the world's toughest. This machine was developed by Yamaha Motor France based on the technology of the YZT850 Super Tenere・factory machine. 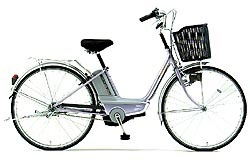 Its engine features a combustion timing crank interval of 270 degrees which produces excellent power development characteristics. 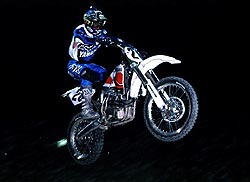 This is the machine that YMUS factory rider Doug Henry rode to victory in the final round of the '97 AMA Supercross series in Las Vegas, making this the first 4-stroke ever to win a Supercross race in the U.S.A. 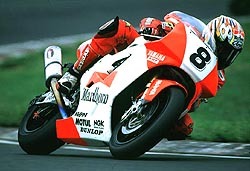 In the '97 500cc World GP Motocross series this same machine won six of the 21 heats contested in the 11-round series. Its lightweight, compact 4-stroke, 5-valve engine is mounted on a specially designed frame directly derived from the YZ250.